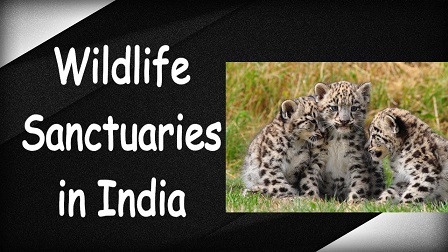 Here is a list of Important Wildlife Sanctuaries in India which will help you in exams like UPSC, BPSC,SSC MTS,SSC CHSL, SSC CGL,Railways and other Banking Exams like IBPS, RBI, SBI Clerk etc. Wildlife sanctuaries in India are established by IUCN category II protected areas. India has 537 wildlife sanctuaries referred to as wildlife sanctuaries category IV protected areas. Among these, the 50 tiger reserves are governed by Project Tiger, and are of special significance in the conservation of the tiger. Some wildlife sanctuaries in India are specifically named bird sanctuary, e.g., Keoladeo National Park before attaining National Park status. Many of them being referred as as a particular animal such as Jawai leopard sanctuary in Rajasthan. Many National Parks were initially wildlife sanctuaries. The conservative measures taken by the Indian Government for the conservation of Tigers was awarded by a 30% rise in the number of tigers in 2015. The Wildlife Institute of India (WII) is an autonomous institution under the Ministry of Environment Forest and Climate change, Government of India. The founder was V. B. Saharia while the first Director was Hemendra Singh Panwar who remained the director from 1985 to 1994. Trained personnel from WII have contributed in studying and protecting wildlife in India. WII has also popularized wildlife studies and careers. The institute is based in Dehradun, India. It is located in Chandrabani, which is close to the southern forests of Dehradun. Wildlife sanctuaries in India termed as an Eco-system is best place to discover rich wildlife and natural habitats. There are about 441 wildlife sanctuaries in India that lure travelers all over the world with its rich land of distinct flora and fauna.